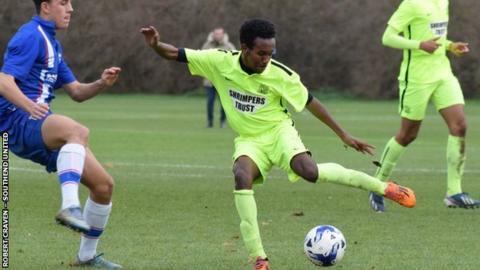 Younis Farah, cousin of double Olympic and World champion Mo, has signed a contract with League One side Southend. The 16-year-old left-back has agreed a two-year scholarship and made his under-18s debut in a recent 1-0 victory against Gillingham. "When I was under-13, I was number three in the country for 800m and used to do well in cross-country as well. "It was always football that excited more, though," Younis Farah told The Echo newspaper. Shrimpers academy manager Ricky Duncan added: "Younis is a good young prospect and you can certainly see that athletics runs in the family when you see him up and down the wing. "He came to an open trial five months ago and he's really come a long way since then, so we've offered him a two-year scholarship to stay in the academy here at Southend."